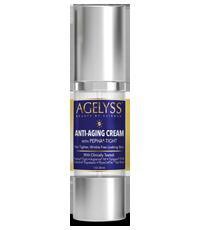 Agelyss Anti-Aging Cream - Does This Product Work? Agelyss™ Anti-Aging Cream delivers clinically-proven, trademarked and patented active ingredients directly into the skin, penetrating deeply to provide an instant face lift effect. Our botox alternative combines 5 clinically-proven, patented and trademarked active ingredients specially formulated to help promote cellular repair, tighten and firm skin, reduce wrinkles and fine lines, soothe irritation, regulate oil production, restore and improve elasticity, boost collagen production for optimal benefits to slow down the aging process. Easy and light to apply, it absorbs quickly without feeling greasy or sticky on your face or neck. Suitable for all skin types and age groups. Water, Acetyl Hexapeptide-8, Sodium Hyaluronate, Acmella Oleracea Extract, Algae Extract, Pullulan, Alcohol, Cetyl Alcohol, Sodium Acrylate/Sodium Acryloyl Dimethyl Taurate Copolymer, Glyceryl Stearate, Caprylic/Capric Triglyceride, Allantoin, Pseudoalteromonas Ferment Extract, Hydrolyzed Wheat Protein, Hydrolyzed Soy Protein, Tripeptide-10 Citrulline, Tripeptide-1, Lecithin, Xanthan Gum, Carbomer, Triethanolamine, Butylene Glycol, Caprylyl Glycol, Rhododendron Ferrugineum Leaf Cell Culture Extract, Isomalt, Epilobium Angustifolium (Willowherb) Flower/Leaf/Stem Extract, Glycerin, Citrus Bergamia (Bergamot) Fruit Oil, Acrylamide/Sodium Acrylate Copolymer, Mineral Oil, Trideceth-6, Phenoxyethanol, Potassium Sorbate, Sodium Benzoate, Lactic Acid, Propylene Glycol, Diazolidinyl Urea, Iodopropynyl Butylcarbamate, Tetrasodium EDTA. SUGGESTED USE: Massage directly onto the entire face and neck. For best results, apply daily, throughout the day. Apply under a moisturizer. Suitable for all skin types. How does Agelyss™ Anti-Aging Cream work? Agelyss™ Anti-Aging Cream works on multiple levels. In the short-term, it reduces the appearance of wrinkles and fine lines while nourishing, plumping and revitalizing your skin to improve skin texture and promote a healthy glow. The long-term benefits include - support collagen production, improve skin elasticity and activate cell renewal to slow down the signs of aging. We utilize a combination of occulants, humectants and emollients to create an effective and exclusive base creams that work synergistically with key active patented and trademarked ingredients, formulated to absorb quickly and effectively into the skin leaving no sticky residue behind. For best results, we suggest daily use. Apply throughout the day as needed. You may adjust your own personal usage to what works best for you. "I never used to use a serum until my mom suggested that I use it before I put on my daily moisturizer. I made a huge difference on the texture of my skin. It feels so soft and smooth and I have such a nice glow. " "It's been a struggle to find the right skincare product until now. I saw my wrinkles getting smoother after only one week! The more I apply it, the better my skin looks and feels." "I've never found a serum like this that offers a full refund for a used container. I was fully prepared to return it if I didn't see a difference, but I actually love it and am now ordering more!" "I never knew that I needed a serum to go under my moisturizer but now that I've tried this anti-aging cream, I can see exactly what my face has been missing! " "After experimenting with multiple products over the years, I’ve determined that this is by far the best daily face serum I have tried. It does everything it says on the label and then some." "I'm interning in a laboratory and heard chemists talking about the ingredients in this serum, so I tried it. It's amazing how much better this product is than the drugstore brands when they cost the same amount! " "I ordered this product because I have used other skincare products from Agelyss and I have been very happy so far. Everything has been of excellent quality and reasonably priced. They also arrived quickly in the mail." "My daily skincare morning routine starts by cleansing and then using Agelyss Anti-Aging Cream, followed by a moisturizer. My friends have all bought Agelyss products now because they think I look so great!" "This anti-aging cream is a necessity for my makeup to stay in place. It's very light and fills in my wrinkles so that my makeup goes on easily and doesn't move around throughout the day. A real game changer." "As someone trying to break into the entertainment industry, the pressure to look young is constant. After finding out about this daily serum, my skin has felt so springy and looks so youthful. What a relief!" "I'm so pleased to have found this daily anti-aging cream that I am writing to you to ask you never to discontinue it! I feel my face tightening up as soon as I put it on. It's amazing!" "Thank you to the scientists at Agelyss for this anti-aging cream! I bought it after doing some research on their patented ingredients and I will keep buying it because it works wonders on my face and neck." "Moving to a cold climate dried out my facial skin so badly - it was so intense! I was hoping to find a product which wouldn't be too expensive but also actually work. Ladies, this is it! Don't wait to try it! " "Hitting my 30s was a big blow for me. Getting older and becoming a mom means all my stress shows up on my face. My daily ritual of applying this serum has made a real difference both on my wrinkles and my confidence." "I am often told that I look like I am in my 30s!! Kudos to me for picking the right face product for me - Agelyss Anti-Aging Instant Face Lift. I am so glad I use this to keep my skin soft and nourished. " "All the sunbathing I did as a teenager has taken a toll on my skin, which is so depressing. Thankfully my dermatologist told me about this daily serum and it has actually been reversing my sun-damaged skin. Now my face soft and glowing." "I cannot stress enough how much I love this product. This anti-aging cream changed my life literally! It brought back my youthful-looking face that i thought was gone forever. Thank you." "Hitting my 30s was a big blow for me. Getting older and becoming a mom means all my stress shows up on my face. My therapy has been my daily ritual of applying this awesome serum. It is meditative, rejuvenating and gives my skin the boost it desperately needs." "At my age, I want an effective product that will minimize my wrinkles and sun spots as much as possible. I found a superb product that I adore...Agelyss Anti-Aging Cream. It keeps me looking young like I feel"
"I love to laugh but I don't love my laugh lines! Luckily, my friend gave me this serum to try and I have been obsessed with it ever since. I have bulk ordered this and even my mom uses it now." "After I hit forty, I noticed my neck starting to sag, so I started trying different products. I could hardly believe when the expensive creams did nothing to help me. This has been the most effective so far. Highly recommended!" "I've never had a serum or cream that penetrates so well. This smooths my skin without clogging up my pores, works great under my makeup and it makes my face feel incredible. " "I strongly believe in taking preventative measures, especially when it comes to the care of your skin. I've been using this serum for a few months now and my face and neck are incredibly firm. " "I love working out in the sunshine but I know how much damage it does to my complexion. Thankfully, the anti-aging cream from Agelyss is affordable enough for me to use everyday so I can just concentrate on getting fit. " "As a Latin woman, I find that my skin needs more nutrients. I use this serum everyday without fail to keep me looking fabulous. It's so light and also powerful - I can't stop raving about it!" "My grandmother always tells me that It's never too early to start taking care of your skin, and I've seen a major difference since using the Agelyss Anti-Aging Cream. " "I have used many products over the years but never settled on anything until I found this Anti-Aging Cream. It is a cream that feels light on my face and yet feels so rich on my skin. My face simply glows." "I never listened to my mother about skincare in my 20s. I should have. Now, I am paying the price. So, I begged her to tell me her secret since she looks my age!! She told me to start using Anti-Aging Cream." "You name it I have tried them - moisturizers, serums, cold creams, etc. I find serums work the best. I use anti aging cream every morning after I step out of the shower while my skin is still clean. " "When I turned 20, I started using face products. I absolutely love the Agelyss anti aging cream. It feels smooth and velvety on my face and it doesn't clog up my pores. Thanks Agelyss for a great product." There are literally hundreds of skin care manufacturers online all claiming to have the best products. But how do you know who to trust? And more importantly, how do you know which Anti-Aging Cream is actually going to work for you? With all of the products out there, you want to make sure you get the highest quality Anti-Aging Cream available, period. Agelyss™ was created to help you find the best possible skin care and beauty products on the market, based on extensive research. 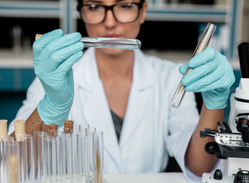 Our team, at Agelyss™, concentrates on the clinical data and actual science to make sure you get the most effective Anti-Aging Cream on the market, hands down. We will guide you through our process of what to look for and what to stay away from. At the end of this page you will have a firm understanding of which Anti-Aging Cream is going to help you and why. Hundreds of companies and marketers have already jumped on the skin care bandwagon to try and create their own version of an Anti-Aging Cream. Most of them disregard the research and put together inferior products to try and cash in on the latest skin care, health and beauty trends. Most creams don't work as they only contain 1 active ingredient, 2 if you're lucky. These products are watered down with about 98% inactive ingredients. We urge you to look into any Anti-Aging Cream you buy to verify what their active ingredients are. At the end of the day, you want a product that will work for you. You want ingredients with a clinical study to backup their claims. And you want a product that will do what it says it will. There are literally hundreds of Anti-Aging Cream online all claiming to have the best product. But how do you know who to trust? And more importantly, how do you know which product is actually going to work for you? With all of the products out there, you want to make sure you get the highest quality product available, period. How Do You Find An Anti-Aging Cream That Will Actually Work? We understand that your end goal is to tone and firm your skin, reducing the appearance of fine lines and wrinkles to maintain a youthful appearance. Plain and simple. And you want the best Anti-Aging Cream to help you do that. You don&apos;t want to waste your time or money on something that won&apos;t work. So, how do you find an Anti-Aging Cream that will actually help you achieve the appearance that you&apos;re looking for? At Agelyss™ we understand that the active ingredients are what make the product work. That's why Agelyss™ Anti-Aging Cream uses a potent concentration of 10% clinically-proven active ingredients. This is unheard of in the skin care industry. Why? Because many companies are led by cost issues and not research. While the percentage of active ingredients is very important, the variety is also just as important. Why? Well, each ingredient serves a different purpose, and when combined, will get you the results that you're looking for. You would need to apply 5 different creams to get the same effect as the Agelyss™ Anti-Aging Cream due to the different types of active ingredients it contains. If you look at most creams out there, you'll notice that they have maybe 1 or 2 active ingredients. Some are clinically proven, others are not. While often 1 active ingredient could be very strong and effective for a certain issue, it is usually not the perfect solution as a total care, all encompassing Anti-Aging Cream. The Agelyss™ Anti-Aging Cream contains not 1 or 2 clinically-proven ingredients, but 5 patented and trademarked clinically-proven ingredients. Each active ingredient serves a purpose to create the perfect Anti-Aging Cream that will deliver top class results. No other product on the market comes close. Agelyss™ Anti-Aging Cream contains, not 1 or 2 active ingredients like other brands, but 5 patented and trademarked clinically-proven active ingredients. A highly purified biotechnologically produced extract derived from microalgae. Tightens skin instantly and increases formation of collagen-1 for long-term skin firming. Also known as a "natural botox". Targets cell communication to tighten dermal architecture. Immediately improves eye contour, smile lines and deep wrinkles. 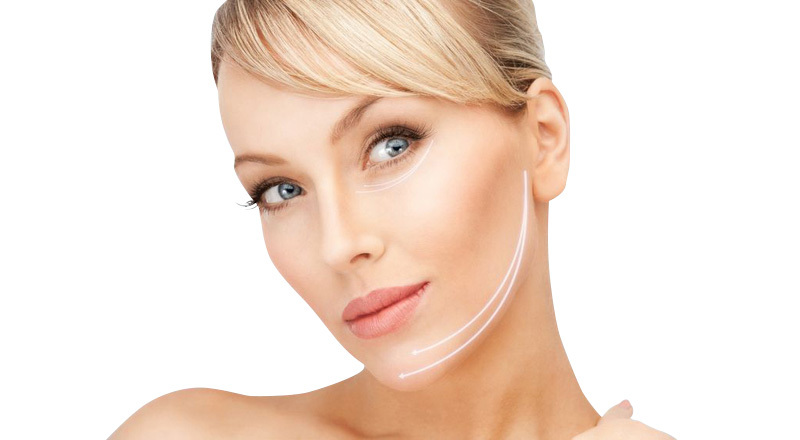 Argireline® NP is a peptide that has been shown effective in reducing existing facial wrinkles and also demonstrated effectiveness against their development with regular use. A combination of active peptides and proteins that combat aging skin, boosts collagen production and prevents collagen degradation to plump out wrinkles and smooth out fine lines. Based on the stem cells of alpine rose leaves which contain special epigenetic factors and metabolites. Proven to preserve human skin stem cells' function and aid skin cell renewal. For a product to contain the Agelyss™ seal of approval, it must go through a diligent research process. Every product we formulate must have the following criteria. If just one criteriion is missing, that's not good enough for our standards. If any Anti-Aging Cream is going to work for you, this is it. If you're serious about the health of your skin and stopping the signs of aging, then you should try a product that is serious about helping you achieve your goals. We did extensive research to ensure that we found the best Anti-Aging Cream on the market and are so confident that it&apos;s going to work for you, that we&apos;re offering you a full year to try it out. 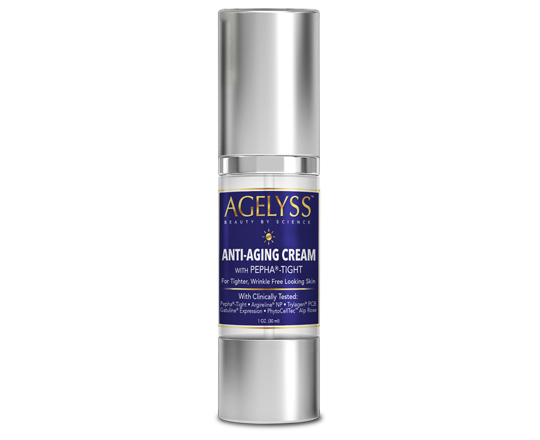 Why Does Agelyss™ Have The #1 Anti-Aging Cream? Agelyss™ Anti-Aging Cream meets all of the criteria listed above. It’s the highest quality cream of its kind available on the market and, it works. 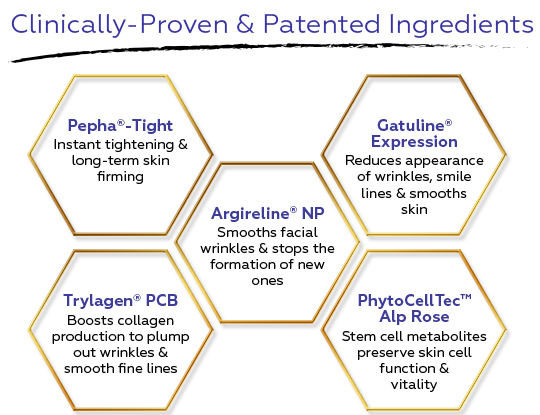 Agelyss™ products are formulated using an unparallelled strength of active ingredients - 10% active ingredients (similar products only contain 2%) PLUS, they contain at least 5 proven ingredients that are patented, trademarked and backed by clinical studies. Agelyss™ creams and serums not only meet all of the criteria of a top quality, effective skin care product - they exceed them! Which Anti-Aging Cream Should You Buy? For instant facelift effects, long-term age defying benefits, and beautiful, luminous looking skin, Agelyss™ Anti-Aging Cream is the answer. This natural 'botox' in a bottle meets all of the above criteria (and more) and is guaranteed to work - or your money back! Why take chances when it comes to the health of your skin? You deserve the best, so choose the best.